BEIJING -- The following are some facts and figures about the closing ceremony of the Beijing Olympic Games, held here on Sunday night. The closing ceremony is held in the National Stadium, also known as the Bird's Nest, in the Olympic Green in northern Beijing. The stadium was jointly designed by Herzog & de Meuron Design Office, and China Architecture Design & Research Group and ARUP. Its construction began on December 24, 2003, and completed on June 30, 2008. The stadium's seating capacity is 91,000, including 11,000 temporary seats. The floor space is 258,000 square meters. The tower, consisting of five stories of elevation structure, is stretchable. Its maximum height is 20.7 meters and maximum load is 20 tons. The round stage is 20 meters in diameter and 1.7 meters high, with a circle of steps in the periphery. The Main Stage is equipped with four rotating stairs and four round rotary elevating platforms 1.6 meters in diameter, the height of elevation being 2.8 meters. Ten steel ropes are above the field, with a total weight of 40 tons. A total of 2,583 special lights are applied. 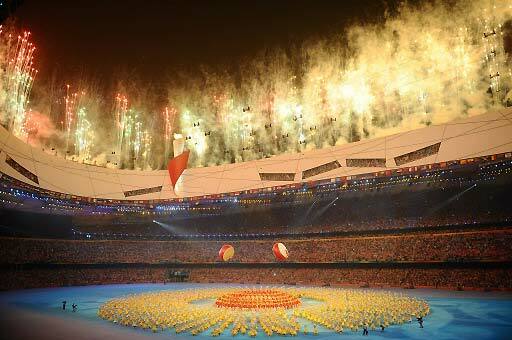 The lighting equipments, weighing over 300 tons, were installed in five months. Altogether there are 4,010 suits of costumes in 18 styles.